Diary of a Lapsed Private Pilot. One Man's Diary of Thoughts and Options for Getting his Lapsed Private Pilot Licence Back. Dear diary, I have no doubt that I am not alone in having a lapsed private pilot licence.(PPL). I am sure that there are many others out there who are also wondering about the best way to get their pilot licence back. I hope that my research may help yours! My logbook shows me that having commenced PPL training on 28th May 1994, my last flight in charge was on 2nd May 2002. At that time I had two very young children and my career was at a pivotal point. The usual problems with getting time off, decent weather and sufficient spare cash to coincide to allow me to go flying were multiplied by many times. The upshot was that my certificate of experience lapsed due to insufficent hours flown within the specified period so I was no longer legally allowed to fly as a pilot. This page may appear a little upside down, with newer entries directly below this box and older entries lower down. That is logical to me and I hope more useful to you Dear Reader. If it is too confusing or you can think of a better way drop me a line. Back in the Saddle and it Feels Good. I have, once again, changed my plan to adapt to circumstances and get things done. If you read my previous post in this diary then you will know that I planned to train in my own aircraft thus completing my differences training and licence revalidation in one elegant and efficient swoop. Perhaps it was the wind, rain and snow, but that plan fell square on its rump and found it too painful to get back up again, so it lay there looking at the sky longingly and adapted. 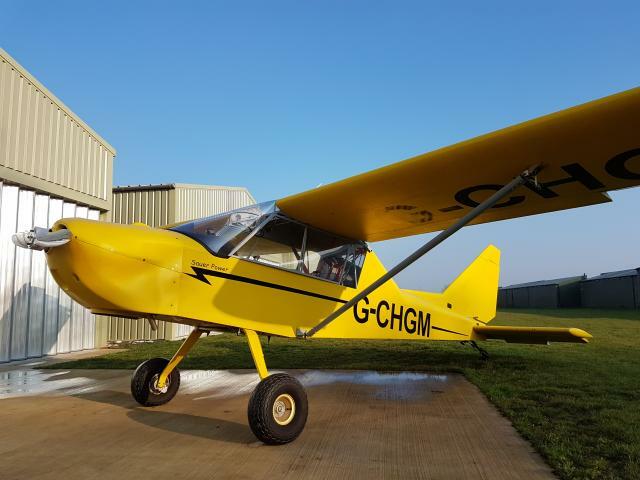 I was recommended to a very nice chap with a Super Cub and we had a long chat about my situation. Sadly, our combined weights did not leave much scope for fuel in my aircraft so I decided we should go flying in his to see how I got on. Quite well as it turned out, much to my relief. We practised some exercises to see if I could still use the stick and rudder to co-ordinate turns to fly in balance while maintaining height, then both climbing and descending to specified heights onto a selected track. Yes, was the short answer. To be honest I was relieved that I did not embarrass myself as well as being really happy that I was finally making progress. At the end of the flight he informed me that my flying was, "Accurate and smooth." What more could a chap desire? (Hey, get your mind back over here...) We did however discover that although he could competently teach me what I needed to know, legal technicalities meant that I could not actually achieve my objective of licence revalidation without significant input from others, including flying in conventional gear school aircraft, with other people. I decided not to pursue that particular course for the time being and continued to look for alternatives. The flight was great though, perfect weather, cracking scenery, a classic aircraft and a sense of achievement all stoked my optimism. I had considered another path with a man who is both a very interesting individual with a remarkable career ( I hope to interview him soon for another piece) and who is an examiner for the CAA. We spoke and it turned out that he could fulfill my ambitions but not only was he extremely busy but there were significant practical issues around storing my aircraft safely for the duration of the training. Even though it was likely to be only a few days it was just not practical in winter at least. In the meantime an old friend with taildragger experience kindly agreed to take my flying in my own machine. I decided to alleviate any pressure he felt by suggesting he take it up for a solo stint to get a feel for it before flying with me, literally looking over his shoulder. Once again I watched my aeroplane take off without me. I imagine I felt a hint of what it was like for the characters I had seen in old war movies, nervously scanning the skies, waiting, wondering if and when the missing aircraft would return. Probably because no one had been shooting at him and due to the lack of barrage balloons in the Lanarkshire area, Mike made it back fine after about twenty minutes. On the upside I got some nice photos of my aircraft as he did so. I then hopped aboard before he could change his mind and off we went. Once clear of the circuit I took over the controls of my very first flying machine for the very first time. As anticipated everything was crisp and smooth as I played around alleviating any lingering doubts that I had not been diligent enough till now. Mike is an experienced pilot but not an instructor so anything we did would not actually count towards revalidation but experience at the controls is never a bad thing and never a waste. I had a crack at some steeper turns and stalling both with and without flaps extended. I believe I may have woken Mike up a little with my stall recovery as it is a fearsome thing in gliders, not the stall itself, just the recovery. I was aware that the process is very different in the power flying world but I didn't tone it down enough which made Mike gasp and me laugh. Look at me laughing while at the controls of an aeroplane I thought as I saw the back of his scalp contract and produce a thought bubble with lots of special characters in it. In a glider speed decays quickly so prompt action is required. This is of course exaggerated when flying as a student but the course of action taught is to get the nose lowered sharply and let the aircraft accelerate to flying speed before pulling up again to the normal attitude. Failing to push hard enough or levelling off too quickly leads to a second stall if you are not careful. Such exercises are often an excuse for hooliganism so bunts are hard, dives allowed to develop and speed is then converted back into height just for the buzz of it. Always though, the instructor wants to see a good handful of negative G as you push over to get the nose down. The proper test is that any dust and grit on the cockpit floor appears in front of the instrument panel, if not your head. That is so not the case in the Group A world, I'll miss that. After getting the feel of the controls we returned to the circuit for a demo landing then a couple of goes by me. The restricted view of both instruments and the runway from the back seat made life interesting as did Mike setting the altimeter to QNH or nautical height, as opposed to QFE or field elevation as I'm used to. The difference is that with QFE (my preference) the altimeter reads zero while sitting on the runway or 1000 in the circuit. As the airfield sits more than 800 feet above sea level, with QNH set it shows 1800 in the circuit and roughly 800 and a bit at the point of touchdown. There are sound reasons for setting it this way, and it certainly forced me to concentrate on the picture out of the window rather than the instruments as I was too busy shaking the rust off my technique for mental arithmetic. On the whole though a couple of missed approaches done deliberately set me up for a nice landing. Not perfect but nice enough that we could not only walk away from it, but the aircraft remained serviceable as well. Job done. Mike had suggested that I speak to one of the instructors from Prestwick who I had flown with once before, years ago for a check ride. Colin had flown the English Electric Lightning in the RAF before going on to fly Jaguars, Phantoms and Tornado even before he became a test pilot. After leaving the RAF he continued as a test pilot with British Aerospace on the Jetstream team. I met with Colin who is as modest and humble as he is experienced and we discussed my plans and objectives in detail through several tangential topics before getting back to the point. I was delighted to discover that he is as keen to fly the Groppo with me as I am to fly with him. There are however still some legal and technical hurdles to jump before such objectives can be achieved. He did offer an alternative suggestion that I am looking at again as a serious possibility having discounted it before. I once took a personality test through my employer at the time and it described me as both flexible to new ideas and deeply pragmatic. I find myself now as a pragmatist having to flex to overcome resistance to an idea that is probably the right choice for me but that does not sit entirely easy with my objectives for this site. I'll let you know how that decision goes on the next entry. Best wishes for a healthy, happy and exciting 2018. Time Flies, but not much else! Time for drastic action, so I bought an aeroplane. Holy Dooley, what was I thinking...??? That is a thought that has occurred more than once since I went down to County Durham to "look at" a flying machine. I promised myself I would not commit on the day, it's just a look, just research. But... it was beautiful, practical, all metal, it folded to fit in a small storage space, it sipped delicately at fuel but had decent, performance, lots of room and could handle rough airstrips, short ones at that. It was even in a striking and classic colour scheme with almost no hours on the airframe. Suddenly I was shaking hands with the former owner, as a new owner, eek! I had some urgent enquiries to make and plans to set in motion, not least where to keep my new purchase. Had I been slightly reckless? "Absolutely not", according to any other pilot I have spoken to since and told that story to. "Most people do exactly that, you were absolutely right to grab the opportunity." Non fliers on the other hand almost all said, "Aye, more than just a bit." Given that this is an aviation site I'm going with aviator's opinions and there is nothing you can say to change my mind, so there. So how did that all happen and what has it to do with this particular section of the site? Good question Dear Reader, I'm glad you are here. As you will know from previous updates I have been gliding to get my hands, feet and eyes back working together to carve up the skies. The trouble is, I don't think I'm cut out to be a club pilot. I'm not taking anything away from those who are, or indeed the clubs themselves, or my club in particular. It's me honest. It is not that I am too good for them or know better, far from it in fact, I have just never quite felt that I fitted in. The site was great and the majority of people were extremely helpful and supportive. For most folk this would be enough and the best, perhaps the only option, it is by no means a bad choice. I found the practicalities hard to live with though. Partly due to the time I had available, partly due to the travel time and partly because of the necessary organisation and rules I struggled. I struggled to reconcile the practicalities with my available time and ultimately what I wanted to do with my flying. The site was flooded for months so I went from being a solo standard pilot on the brink of the Bronze award to being a student again scrabbling for an instructor and a suitable aeroplane on a lengthy flying list, as pretty much everyone else was in the same situation. This enforced gap made me nervous about going back if I'm honest and I found many, many excuses to delay my return to the air, even though I loved every second up there. It's complicated and I'm no psychologist so let's just run with it. I found though that I was not too shabby at the controls when I did get back in the air, but my frustration levels at seemingly inconsequential things soared, my tolerance for the whims of certain people , good (mostly) well meaning people evaporated. One decision by an instructor baffled me, angered me and probably secured the developing decision that it was time to move on. Even in retrospect I cannot for the life of me understand his rationale and discussing it with him on the ground did nothing to clarify his position. He was wrong, I've checked. I can live with mistakes, I've made plenty. I am not by any measure a better pilot, I can agree to differ and I respect other people's opinions, but for some reason that was it for me. My ambitions for the future meant that powered flying was the only option and that trip just put the lid on the decision. Gliding is fun, try it you will love it, I fully intend to get back to it sometime, but that was it for me for now. I began to look earnestly at options to fulfill my goals. My old CAA licence is of the non expiring type so I checked several sources and discovered that what is needed to revalidate (a least currently in November 2017), is "Sufficient training to pass a skills test". Previously it was possible just to sit the skills test but that is apparently no longer the case. 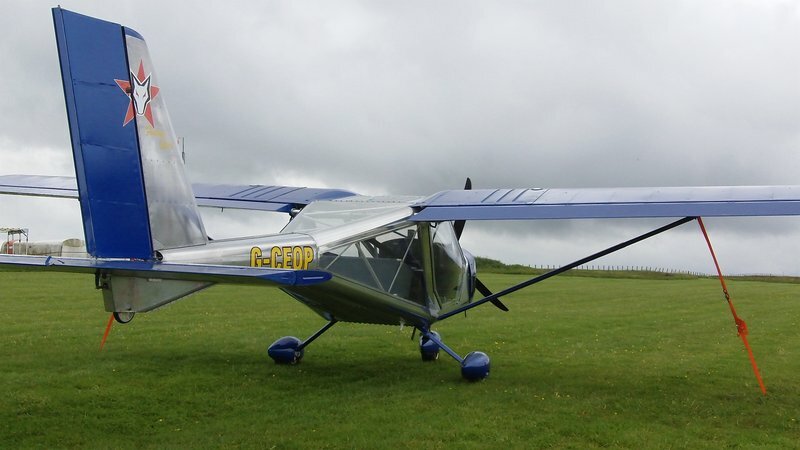 I had decided that what I needed was a good old fashioned taildragger type to allow me to explore the more remote and exciting corners of our beautiful country, utilising short and rough airstrips. As all of my previous flying experience was on the standard nose wheel setup so I would require "differences training" to convert. Ok, so I could obtain a taildragger and train in that thus revalidating my licence, completing differences training and learning to fly my own aircraft competently. Simple. Not quite. Taildragger qualified instructors are few and far between, those who are prepared to train a student on their own aircraft are apparently even rarer, and they are usually very busy people. (Enough said I think.) My Groppo Trail is a very pleasant aircraft to fly and so far at least I have not embarrassed myself so I am confident that freedom will not be far off. It also has operating costs way below those of a school aircraft. While I may still have to rely on one of those, I can at least take the sting out of the cost of training. The aircraft was expensive and my obtaining it relied on a series of circumstances and events, not all of them good, falling into place. It is however an investment in my future that should pay dividends in the long term. It is most certainly not an option for everyone, but aircraft are more accessible than you might imagine. Check out AFORS and see for yourself. I am still relying on other people, I am still a member of a club, I am still looking for the right person to bring my training up to scratch and an examiner to judge my flying on a skills test, but I am also much happier. There are still frustrations but I now have a degree of control and more of a say it what happens. That is what is missing, for me at least, in the club scene. Flying clubs are valuable, worthy institutions that should be encouraged and supported, some are absolutely fantastic and some really need to have a look at themselves. You need to decide for yourself so go and visit, have a coffee and meet some aviators, you will benefit from it and you might even squeak a free flight, at least offer to buy the beer afterwards. Good luck, stay tuned for the next instalment. Alexander and I walked into the clubhouse one day and spoke to the club secretary about Alexander joining the Cadet Scheme. "Great idea, no problem but would you like to sign up for the next course? It will fill up quickly." The course was five days long Monday to Friday and started on the 26th of May. Not too long to wait and a weeks intensive flying sounded just the ticket. How much? £350 each and if you don't use that much flying time for whatever reason we will refund the difference. Wow! Even better, if you really go to town and fly more than that we will not charge you any more. Wow, wow! Ok where do I sign? The course is even cheaper for members who are solo pilots as they use less instructor time but can complete tasks towards the Bronze badge. I tried over the next couple of weeks to get to solo standard but realised that on busy club flying days that would be really difficult to do. I needed short flight to practice cable breaks and circuits but that puts you back to the end of the queue after only a minute or two flying time. It could easily take hours to get back in the aircraft. A course was really appealing. The instructor was to be Kate Byrne who was described as "Very calm and laid back, she let's you get on with it and helps you out when you need it. A Chuck Yeager type." I had spoken to Kate before, in fact she was one of the ones who convinced me, without trying very hard at all, that gliding was the way forward and Portmoak was the place to do it. Portmoak airfield framed neatly between glider wingtips. Photo by Alexander Walker. I originally learned to fly in one of these Venture motor gliders, courtesy of the Air Training Corps. In case you were wondering they were old even in 1987. I have to admit to feeling quite nervous when I strapped myself into the ASK21 sailplane after 11 months on the ground wishing I was flying again. The briefing was slightly unusual as well as it consisted of me saying more to my instructor than him telling me what to do. His input was a very pragmatic, "Let's go flying and see what you need." This is a perfect example of the relaxed, efficient and friendly approach that persuaded me to join the Scottish Gliding Union at Portmoak. It is more about you, the pilot (or student) than the instructor. We agreed that I would have control for the launch and flight over to the ridge and then he let me get on with it with just a few prompts to keep things smooth. Once the canopy is closed and the cable is on and secure the process of controlling the launch and communicating with the winch driver transfers to the assistant on the wing. I watch the cable go tight and fly the glider out of his hand. We are off the ground and climbing at 60 knots in less than five seconds. 100% concentration but trying to relax and get the most from the launch. It went OK, I could have pulled a little harder throughout, been a bit smoother and got some more height from the launch but we got to 1000 feet and I didn't get told off for anything! Knocking off the rust from my flying skills. I spent the next 45 min getting my hands and feet to work together again. I had forgotten how much more pressure is required on the rudders to stay in balanced flight and keep the string flowing straight back along the canopy. We climbed to cloudbase, just under 2500 feet and practiced some turns, stalls and cable break drills before heading back to land. Practicing cable breaks at height saves time, launch fees and stress on the aircraft. It is also mighty good fun! A dive to pick up speed, pull up into the winch launch attitude (about 60 degrees nose up, heels above the head) and as the speed bleeds off to about where you would be the instructor calls "bang". You must then smartly put the stick forward and get the nose down to build up speed and wait......... wait...... until you have 45 - 50 knots and then recover to a normal flying attitude. Speed, positive G and negative G all in the one go, what more could a pilot ask for? It is an essential skill though as cables do break sometimes leaving you in an awkward attitude with no power. Sailplanes are built to fly and fly well, so there is no big deal as long as you follow procedure and you are smart about it. My circuit planning and round out to land were probably the areas most in need of attention but that is not really any surprise. As you only get one attempt with each flight in a glider, then that is work for another day. All in I had a hugely enjoyable flight and I feel at least some of my confidence restored. I have signed up for a week long course in May and I have a personal goal to be solo by that time if at all possible, certainly by the end of that week. Alexander and Instructor Kate Byrne with Bishop Ridge in the background. This was taken shortly before Alexander's flight when he took the view from the ridge at the start of this article. Possibly the best part of flying gliders? It cost £8.50 for the winch launch and £27 for an hour's flying. Alexander has just joined the cadet scheme where for just £8 you get a launch and 30 minutes in the air. There are limitations in that those paying full price take priority, but there are plenty of cadets who have gone a very long way in their flying careers indeed. I cannot believe that it has been a year already since my last post! I have been grounded for most of this time by a combination of an ailment and horrible medication that would not have made flying sensible. I have to confess to something of a loss of confidence after that so getting back in the seat has been a daunting prospect. That and the wettest winter in 400 years! as spring is in the air I have found myself looking longingly at the sky and reaching for the phone. This week has largely been spent on a search for a decent but low cost video camera which I can use in the cockpit. Sitting so low in the cockpit with little spare room means the mounts really have to be on my head. Avoiding scratching the canopy is also a huge consideration so it has to be small and light enough not to get in the way or be distracting. There are some stunning pieces of kit around but they come with a hefty price tag. I finally settled on a mini HD (allegedly) device which I found in a gadget shop in Glasgow. I hope that it will not only record some of the stunning views from the cockpit but will allow me to analyse each flight. Learning from the mistakes on the ground is cheap and leisurely while in the air it all happens very quickly. Cheers Alan, I'll let you know how it goes. Today saw significant progress towards regaining my solo proficiency sign off. 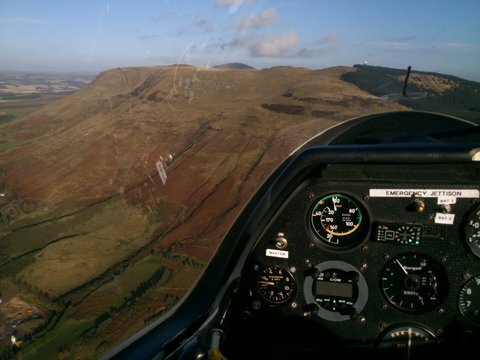 We managed to catch some wave lift on the first flight of the day and rose to 8000 feet over Knockhill. The air at height was silky smooth and provided a platform for plenty of flying exercises. I practiced basic stalls, stalls with wing drop, steep turns and sideslips. Each of these exercises have a particular relevance either because they have a particular use of their own such as sideslips to lose a lot of height quickly for a steep approach. Or because they have a risk of catching you out by getting into them accidentally as with the stall. I finally found a directly transferrable skill from powered flying in performing sideslips. It was very gratifying to hear a "well done, that was nice" from the instructor on the first attempt. A side slip is a manoeuvre where the controls are crossed over to present a large side surface to the oncoming air to lose height quickly. Left rudder with right roll and back pressure on the stick means that you descend quickly with a very good view of the landing area. This is very useful for landing over an obstruction such as tall trees or if there is no room for a circuit. I then went on to fly several circuits from launch to full stop with minimum intervention from the instructor. Circuits in a glider are very different from what I have been used to on powered aircraft. A winch launch is a much more rapid affair than I'm used to both in terms of acceleration and rate of climb. The aircraft accelerates from 0-60 mph in about 3 seconds and climbs to over 1000 feet in well under a minute. My old Cessna would not even have made it to the end of the runway in that time. The circuit is now a different shape as well. 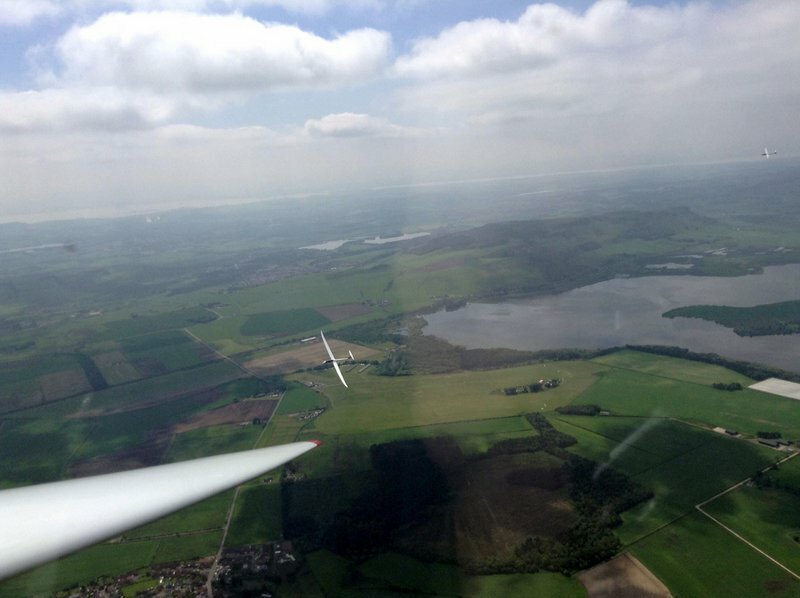 Rather than the regular rectangular shape gliders fly a diagonal on the downwind leg before turning onto base leg and a short and steep final approach. Probably the most challenging aspect for me was adjusting to the steeper final approach. Initially I was well behind the demonstration as I was looking much further ahead than our actual flight path would follow and found it hard to follow the instructor's inputs. Flying the approach myself though made much more sense and I was able to get my eye in quite quickly. Five circuits both left hand and right hand into three different landing areas presented no real problems. I actually enjoyed the re planning for an alternative landing area mid circuit. The first time it was because I did not appreciate how close an obstruction actually was to the centre line and the second because another glider had landed ahead of us. As gliders cannot clear the runway under their own power they do tend to cause an obstruction. The circuits were flown in flat calm conditions so I need a few more in the breeze before I get a final sign off. The next priority will be practice cable breaks, similar to an engine failure on take off for powered pilots but probably more exciting due to the steep climb angle. I can't wait! My second and third days of flying naturally built on the last lesson. Conditions were calmer although the cold air meant a steamed up canopy in next to no time. Cockpit drills were more or less completed with the canopy open and we relied on a slick operation between the winch and launch assistants. It takes at least two other people to get me into the air, the winch driver and the cable / wingtip guy (or gal obviously!) Sailplanes need someone to support the wingtip at launch as the wheels are all along the centreline. The aircraft sits wing down at rest and has no means of holding it up without outside assistance. Once cockpit checks are complete and the canopy closed, the pilot asks for the winch cable to be attached. The assistant connects the cable and tests the connection. The assistant then has control of the launch. After checking all clear above and behind the aircraft being launched a signal is sent to the winch operator first to take up the slack in the cable then "all out" for launch. After a soaring flight to polish up some of the old handling skills and develop some new ones specific to the aircraft type it was back to the circuit for some mild panic. The ASK21 is very easy to fly but processing the information coming from the instructor in the back seat while concentrating on the landing is actually quite a workload at first. On the upside the evaluation at the end of the day was that I would have got us up, around and down without any major problems. Not solo standard yet as we still have to knock off the rough edges and practice the equivalent of an engine failure after take off, cable breaks! Fingers crossed for decent weather again for my next outing! I can honestly say that I have not looked forward to anything as much as going gliding today for many years. I had been checking the weather forecast and keeping my fingers crossed for the promised good weather all week. It was still dark but very clear when I woke up. A quick check of my answering machine showed that I had no missed calls telling me not to come. y only real concern was that after the recent very wet weather the airfield would be flooded or at least too wet to use. On my arrival, slightly later than intended I met my instructor Chris. 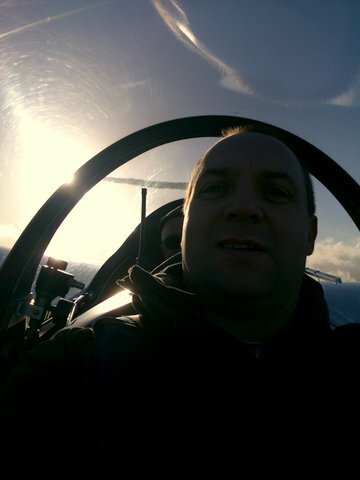 He is one of only ten full time gliding instructors in the UK and instantly likeable. I also met Dougie, my fellow student for the day. There were no lengthy briefings or boring admin tasks, just a quick but thorough safety briefing in the clubhouse. The rest was taught as we encountered it, totally hands on. I had first flight of the day and felt surprisingly relaxed. Chris reminded me of how full on the launch was by winch and that he would be flying it. 0-60 in 3.5 seconds and close to 60 degrees nose up to over 1000feet above the airfield. It was as exhilerating as it sounds and I could not contain my joy at being back in the air. The top of the launch and the flight over to the ridge was quiet and smooth and a few moments later Chris gave me control and a rund down of what to do to catch the lift off the hill. I was pleasantly surprised to find the ASK 21 easy to fly even with my rusty fingers. The landing was something else entirely. Chris took control back and I followed on the stick and pedals. The circuit and approach were very different top what I'm used to. As we turned onto what appeared to be final approach I thought we were awful high, to the point I wondered if we would stop before the trees. I had every faith in Chris of course but I was very puzzled by the set up. I was looking way too far ahead and thinking power approach not glider approach. (Understandably I think.) Not only did we make the field but stopped inside the first quarter without ground brakes. There was a fair wind blowing with 40knots at 2000 feet and hardly anything on the ground so a steep swift approach was no problem for someone who knows how. I had two further flights during the day where we practiced the basic skills including stalls which are really gentle in the sailplane. Chris in best salesman mode got me hooked by flying a loop and a big sideslip to land. Great fun. Due to the weather and the windshear in particular I did not attempt landing or launch. That said Chris was pretty happy with most of my handling so next time I hope. I have now joined the club and have the papers to renew my medical certificate. Availability and shifts prevent me from flying for the next few weeks but weather permitting I have my next two slots booked for coming weeks. I can't wait. Having pondered for some time I have not only decided to return to flying via gliders but I have also booked myself a day course! I decided that the low cost and simplicity was very appealing. I should be able to brush up on the theory quickly enough and the practical elements for going solo should not be too difficult. I originally learned on a Venture motor glider and went solo inside a week. Even being as rusty as I am, I remain hopeful that it will come flooding back. A Venture motor glider, my first solo aircraft circa 1987. 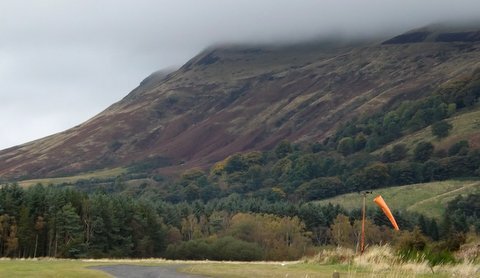 A day course at the Scottish Gliding Centre at Portmoak currently costs £155. I will be paired with another student and an instructor. The plan is to get in as much flying as we can in the course of the day and see where that leaves us. I intend then to take advantage of a mini course and take on club membership to learn the basics of soaring. Portmoak is a well chosen location as it has two ridges in the immediate vicinity allowing ridge soaring in all but an Easterly wind. Once I am cleared for solo work in the ridge then I can start building some serious time very cheaply. Club aircraft cost £0.44p per minute up to a maximum of £60. The only additional cost is the launch fee which is only about £7. (Even an aero tow is surprisingly cheap!) That means that you can in theory stay up all day for less than £70! That amounts to about twenty minutes in a Cessna! Bishop's hill at Portmoak. Closed to glidersat the time due to cloud. I am excited at the thought of the challenge of learning to soar but even more so at the prospect of getting airbourne again. I love the thrill of flight and the absolute beauty of the view from the air. I never really planned to tour from airfield to airfield so I don't think I'm missing out on having an engine. Maybe that will change but having my wings back will make any conversion to a powered type much simpler. OK so I thought I was sure about taking the microlight route back to flying. I bought the books and have been knocking the rust off the brain cells quite successfully. Today I took a trip to Portmoak airfield, the home of the Scottish Gliding Centre. My original plan for the day had fallen through so as I was only about half an hour away I thought I'd drop by. The "Visitors Welcome" sign at the gate was a total understatement. From the moment I walked through the door I was greeted with genuine warmth and I was soon being introduced to the Chief Flying Instructor, club secretary and other members in the club lounge. All were obviously keen to discuss their favourite sport and debate the pros and cons of different types of flying. Needless to say given the location gliding scored very highly in all areas. It gave me a lot of food for thought as speaking to people who really know what they are talking about often does. Clearly I was by no means the first lapsed PPL pilot they had had the same conversation with. I had two concerns about gliding as an option. 2. The lack of ability to fly into other airfields. OK flying in is easy but unless they have a winch or aerotow available there is no getting back out. There are two ridges nearby for soaring so only Easterly winds are not catered for. The UK altitude gain record was set at Portmoak (33,000 feet) and one member recently completed a 1000k round trip cross country. Practicality and access not rerally an issue then! The ability to visit other airfields then is the only issue. Aha! How often would I actually do that in reality? From experience, not often at all I think I have only landed away once for the day for a fly in. I know most club pilots go and fly around for an hour and then return to their home airfield. To counter that concern the cross country aspect means that I can really challange myself and potentially see the whole of the country from the air. I can drive to the cafe if I really felt the need after all! Before my licence lapsed I had wondered where my flying was actually going? Initial thoughts of additional ratings and an instructor ticket quickly proved impractical. The possibility of obtaining an instructor rating for my gliding licence though is very real indeed. The real benefit is the cost! 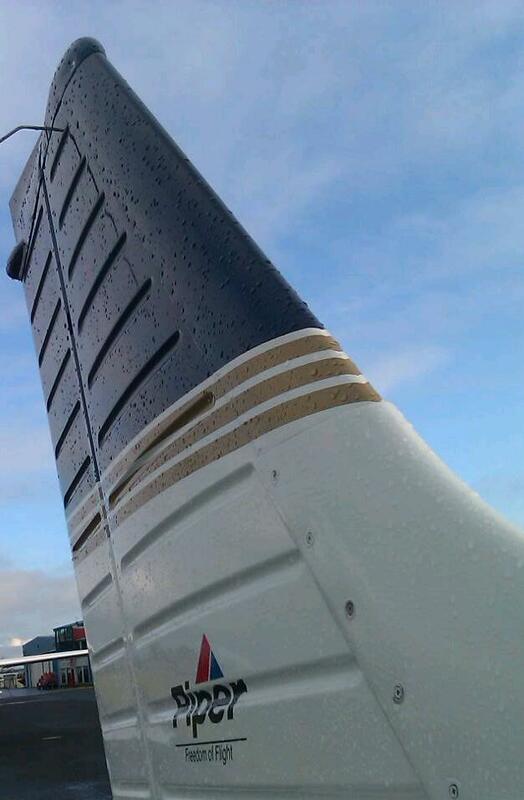 £7.50 for a winch launch and £0.44p per minute up to a maximum of £60 regardless of flight duration! Wow! Instruction is on top of that of course but that is only about £20 per hour. I almost signed up for one of the packages there and then. A half day course is £155, probably not enough to get me solo. They also offer a £250 learn to glide course which includes three months club membership and BGA registration. That provides 22 launches, several 30 min soaring flights and another half dozen or so hour long flights all with instruction. That would probably not even cover an hours instruction on a group A type, especially once you get into landing fees for circuit practice. Even if I do no more than this it will be enough to significantly brush up my rusty flying skills. If I then chose to fly the more expensive but still relatively cheap microlight I should need far less time to pass my flight test. 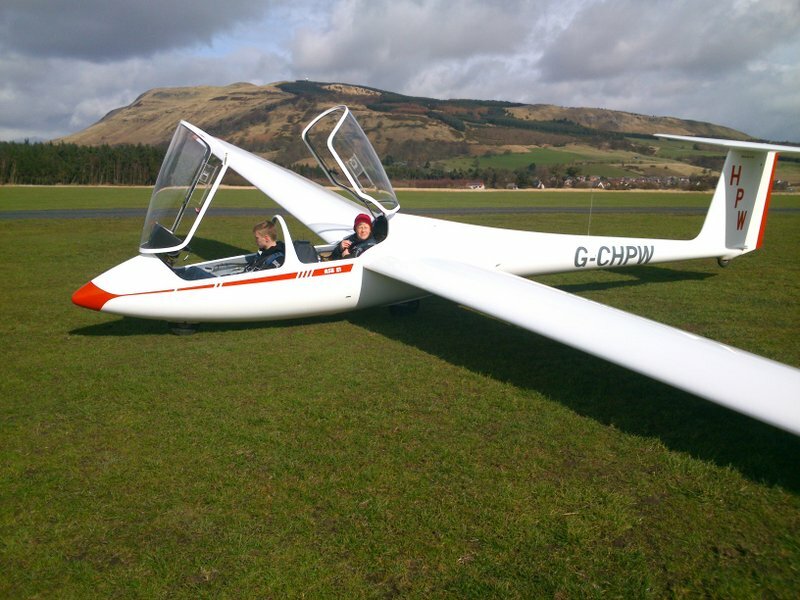 There is also the option to "upgrade" to a self launching motor gliding licence, which takes ten hours or so of cenversion. (£30 or so pounds per hour plus instruction!) That would take care of the landing away issue. I really need to sleep on this one. Purism versus touring ability, that is the question. So, I have decided to do whatever it takes to get myself back in the air. The decision has been made and the quest now begins as to the best way to go about it. I suppose the trick is to do it in a sustainable way. Having had my licence lapse once, I don't want it to happen again. I was asked to share my thoughts and findings with the readers of PilotScotland.com as there are many more people asking themselves the same questions. Looking back I learned quite a bit about myself and what type of pilot I wanted to be. I initially harboured ideas about getting additional ratings and possibly gaining a commercial licence eventually. I quickly discovered though that although a full Airline Transport Pilot Licence offered the prospect of a decent salary, nothing less than that was likely to return the investment. I had already asked the Queen if I could fly some of her aircraft as she has some crackers, even though people from other countries tended to shoot at them. Sadly she declined my offer. Airlines were no longer offering sponsorship and I knew pilots who were struggling to get UK based jobs despite having plenty of experience. Being a bush pilot certainly appealed but the reality of that was a non starter as I had a family to support. No travelling abroad for an uncertain position was not appealing either. I'm fully aware in myself that despite the glamour of flying for an airline the reality would likely become tedious for me and ruin my hobby. I really wanted the freedom of flying just for fun and seeing Scotland from the air. A chance meeting with a work colleague led me to discover that he flew Microlights. He told me that my Group A licence would allow me to do the same so I went to Strathaven airfield for a visit. One of the local pilots took me for a trip in a Thruster and that did it for me, I was convinced that this was the way forward. The first question to answer is "What do I want to do with my licence?" Time built on microlights will cut little ice for job prospects but if you want to fly for fun it is a very good option. If you want to do some serious touring or hours building for a commercial licence then you should consider a "Permit" aircraft operated under the auspices of the Light Aircraft Association. While this would require some investment in a share (or whole) aircraft if you can afford it the hourly costs are far less. You have to factor in maintainance, insurance and hangarge though. Otherwise joining a club and paying by the hour is probably the best option for most people. Personally I'm inclined to return to Microlights as they are cheaper, more fun and modern examples are virtually indistinguishable from the "real" thing. Believe it or not the aircraft in the pictures above and below are both microlights. The next step for me then is to get back into the books to refresh my memory for all the theory while I look for a club and an instructor. Just how much I will need will depend on how rusty I am and how scared the owner is of letting my fly one of his assests on my own! Diary Of A Lapsed Private Pilot to Home.